Book: The Western Case for Monogamy Over Polygamy - John Witte, Jr.
For more than 2,500 years, the Western tradition has embraced monogamous marriage as an essential institution for the flourishing of men and women, parents and children, society and the state. At the same time, polygamy has been considered a serious crime that harms wives and children, correlates with sundry other crimes and abuses, and threatens good citizenship and political stability. The West has thus long punished all manner of plural marriages and denounced the polygamous teachings of selected Jews, Muslims, Anabaptists, Mormons, and others. 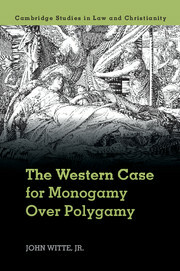 John Witte, Jr. carefully documents the Western case for monogamy over polygamy from antiquity until today. He analyzes the historical claims that polygamy is biblical, natural, and useful alongside modern claims that anti-polygamy laws violate personal and religious freedom. While giving the arguments pro and con a full hearing, Witte concludes that the Western historical case against polygamy remains compelling and urges Western nations to hold the line on monogamy. The American case against polygamy.